Don, is that your real trail bike!!! it intersects with the Providence & Worcester Railroad tracks in back of Fisher Ballfield on Ferry Street. The concrete pylons in the canal trench were once used by the Wuskanut Mill to transport fuel oil from therailroad to the mill. taken from the Pleasant Street canal bridge. site in South Grafton. The white snake like structures across the canal are oil absorption booms that prevent bunker oil still seeping into the canal from going downstream into the Blackstone River. and Canal Street, near the present day signalized railroad grade crossing on Pleasant Street. This bridge is on the proposed route of the BlackstoneRiver Bikeway and is adjacent to Grafton's Follette Street Park, directly on the north side of the railroad line and one of several open space sites that could be linked together to form a South Grafton Greenway. This bridge is just west of the site of the former Saundersville passenger station, operated by the New Haven Railroad. That site is now a vacant lot off Elmwood Street. The wooden railroad station still exists, cleverly disguised as a residential house in another location on Elmwood Street. The Blackstone River and the Blackstone Canal combine at this point and run together parallel with Canal Street until they cross under Pleasant Street at Leland's Landing, an historic canal lock keeper and trading post site on the Blackstone Canal dating from the late 1820's, where one of the three canal locks in South Grafton was located. 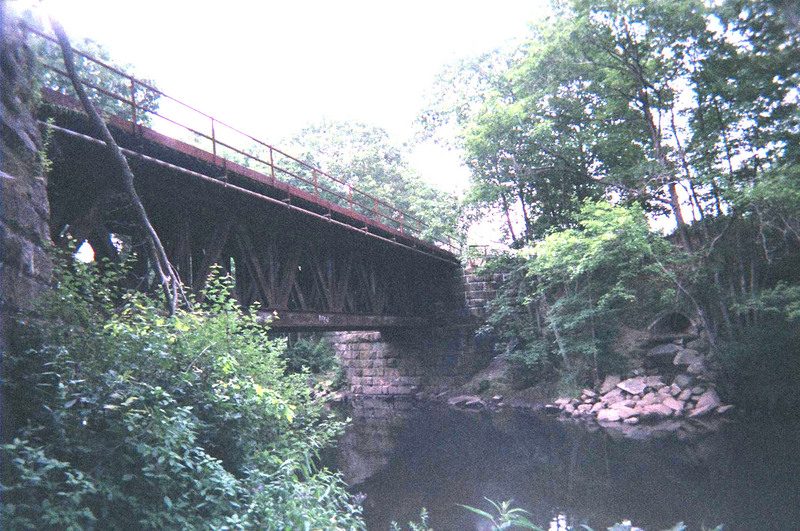 The granite bridge abutments are generally believed to date from the start of the railroad in 1847 and are one of four railroad related sites in Grafton listed on the Massachusetts State Register of Historic Places. The abutments are similar in size and style to those found at the railroad bridge crossing overhead on Route 122A in Wilkinsonville near the Aggregate Industries plant and Sutton's new Tricentennial Park. The steel railroad trestle, believed to date from the early 1900's, reportedly replaced one of several sets of wooden covered bridges found throughout the early Worcester to Providence railroad line. approximately at the Northbridge/Grafton town line on Route 122/Providence Road. canal as close to it as possible. Lots of small undergrowth but fairly walkable. The canal trench looks to be completely intact, rather straight in form. was watered and today the current was moving quite well. sunlight, most are in shade. river itself jogs left and the canal continues straight. open, flowing water all of the way south to the Northbridge line. the fire suppression system for the Farnumsville Mill. resulted from digging the canal trench? the canal ditch on the berm then the towpath is pretty much intact. and the canal closed in 1849.